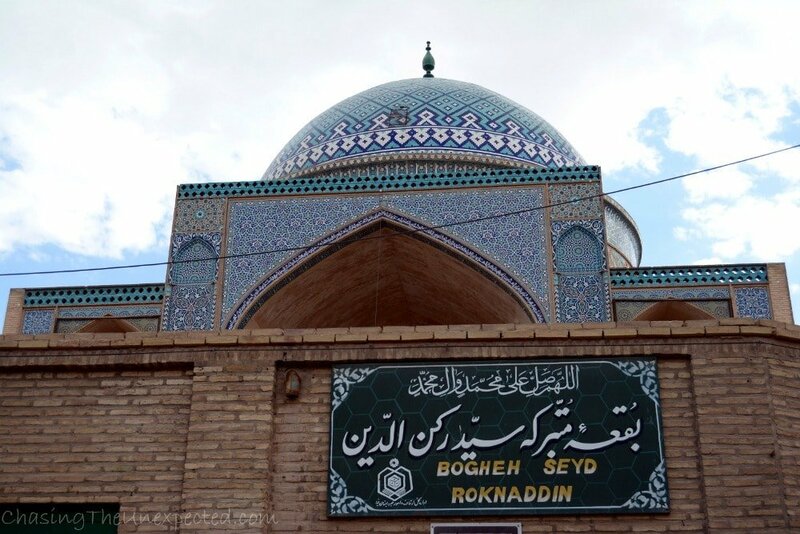 With this in mind, we arrived in Yazd, the capital of its namesake province of central Iran. Or better, we were dropped sort of in the middle of the desert by the friendly owner of the coach we took from Isfahan bus station, where locals didn’t miss the occasion for making fun of us saying that that particular bus company is used to leaving passengers in the middle of nowhere, instead of the city center. It didn’t matter that like two infuriated bees we hurled all kinds of warnings at the owner, as anticipated, in fact, we were left in the middle of nowhere. We managed to grab the attention of one of the very few cab drivers passing by, likely the least loquacious in all of Yazd, who, after reassuring us that even though the trunk was left open and we were darting at full speed on an unforgivingly potholed road, our suitcases were totally safe. Needless to say, after such an adventurous ride, the driver, according to tradition, dropped us in the middle of nowhere. Granted, not far from our hotel, but still somewhere unfamiliar in the slightly-pink sand-hued labyrinth. If you come by bus like we did, you will quickly understand when you are approaching Yazd: the already seldom vegetation starts disappearing all together, a forest of wind catchers (badgirs) sketching the skyline. 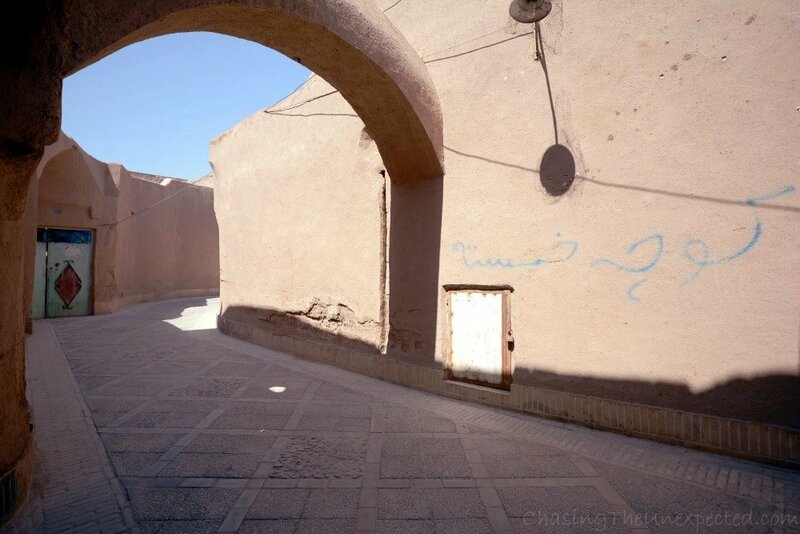 Yazd might have been a quiet, desolate place a couple of years ago, but right now it definitely is a bustling city with all sorts of vehicles racing back and forth the main roads, markets, shops and shopping malls open all day. 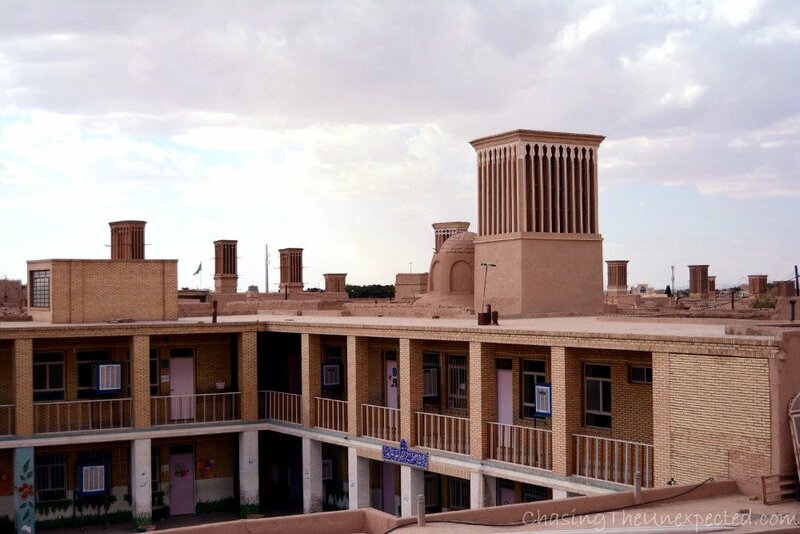 Still processing the transformation, Madi kept muttering that modern urbanization had evolved too fast in Yazd, faster than other places she would have rather expected, merely giving older and younger generations the time to catch up and accustom themselves to their new reality. 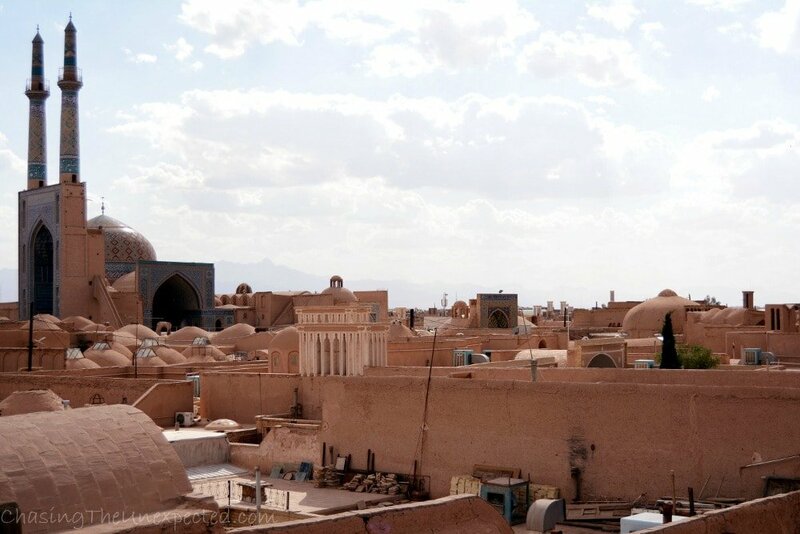 This being said, yes, Yazd is indeed bustling, hectic and all that, but this doesn’t mean it has sacrificed its intimate identity and given up on the authenticity that has made it one fascinating must-see in Iran. 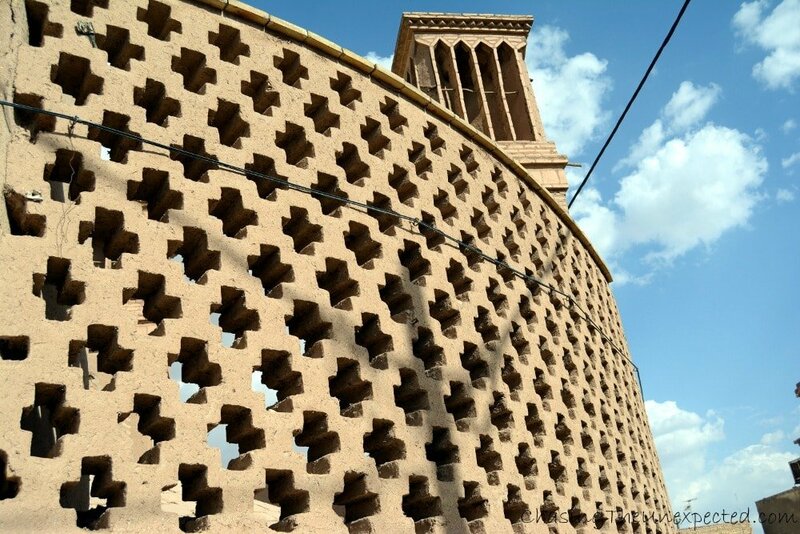 It’s easy to get lost in central Fahadan district, a charming maze of narrow alleys lined with sand-hued traditional houses mainly built with mud bricks and dome roofs, embellished with quaint wooden doors featuring two types of knobs, one for female guests and one for men. The city center probably still looked like Madi remembered, quiet, untethered to time, motorbikes occasionally passing by, not many people walking around, especially during the hottest hours that even in May, when summer hasn’t stricken yet, can be pretty rough. As a matter of fact, the waves of modernity notwithstanding, here in Fahadan neighborhood the atmosphere has remained authentic, reeking of that ancestral identity that seems lost once out of this yesteryear district. 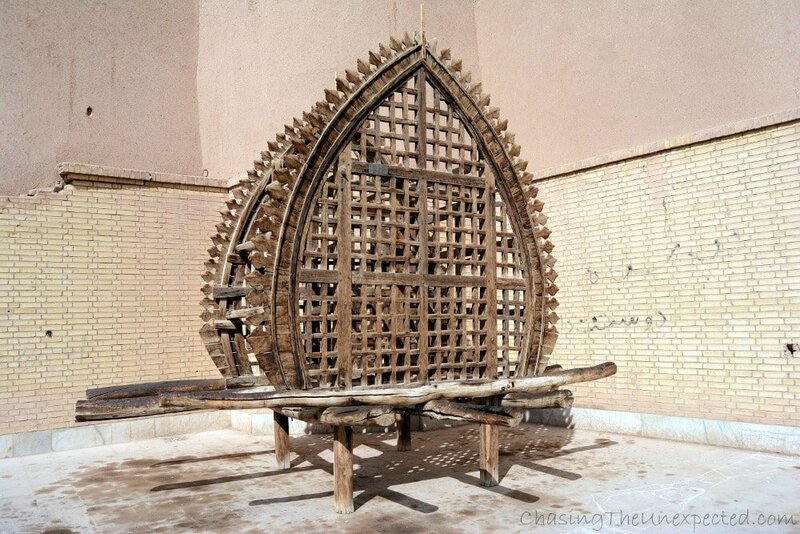 But this is not the only place that shows how Yazd is still proud of its own culture and past. 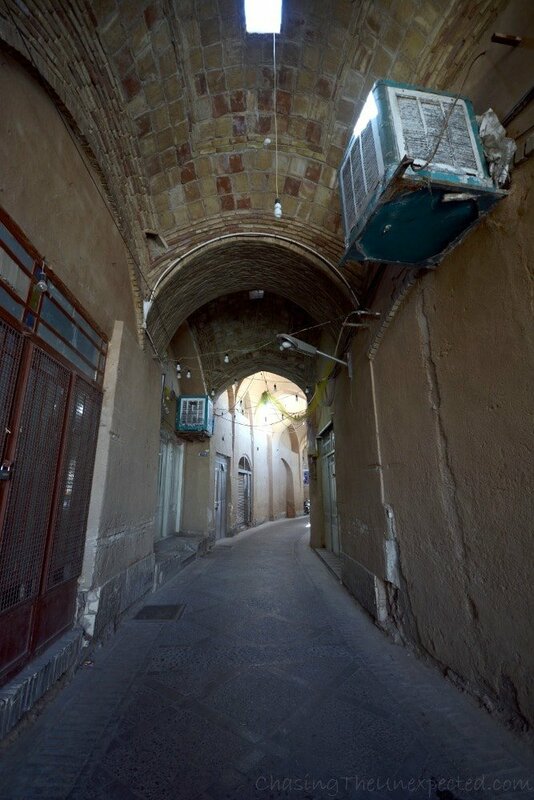 In Kashan Street lies the heart of Zoroastrian religion, the Fire Temple, Ateshkadeh, enshrining a fire that is said to have been burning for 1,500 years. 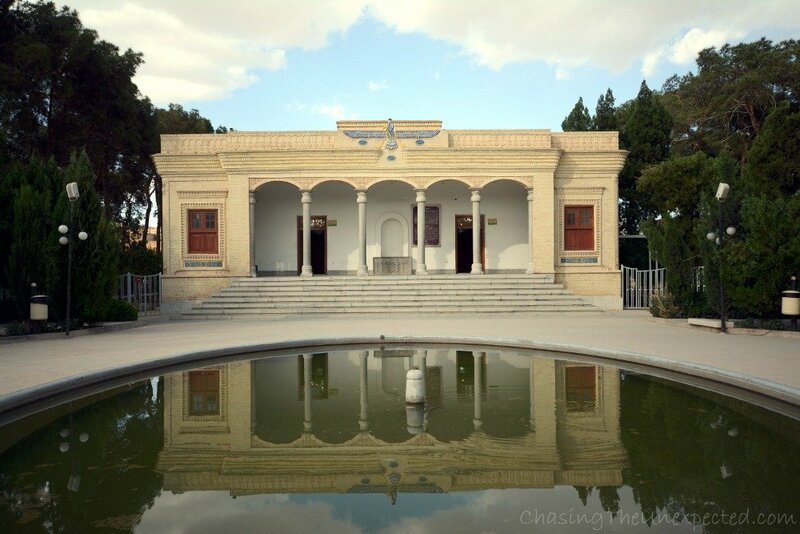 Zoroastrianism, very much alive in Yazd, is the world’s oldest monotheistic religion (apparently containing also the features of a dualistic creed), founded by Prophet Zoroaster (otherwise known as Zarathustra) some 3,500 years ago and soon become the official religion of ancient Persia. While back in the day it was one of the world’s most powerful religions, one that inspired both Christianity and Islam, today Zoroastrianism is a minority cult in Iran, still practiced also in India under the name of Parsiism. According to Zoroastrians, very much respectful of the earth, the four elements are pure, and the fire represents God’s wisdom. 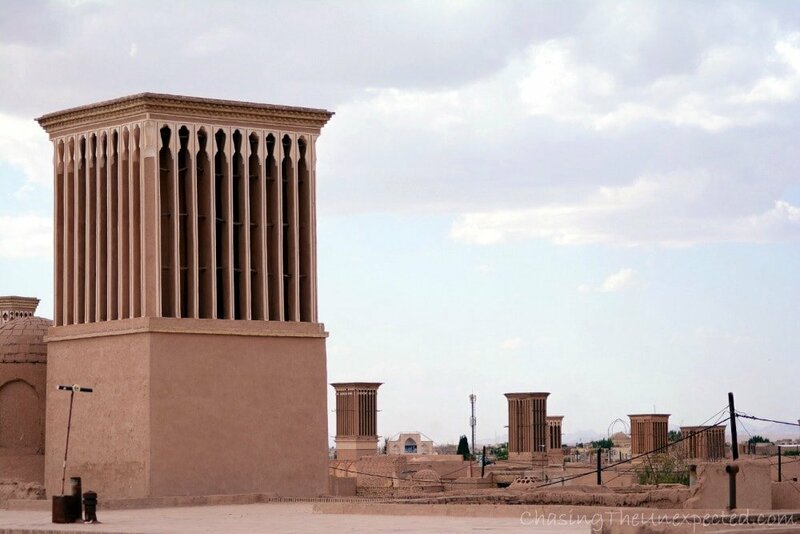 This might well be why Yazd’s Fire Temple was the busiest place I visited when I was there last May. 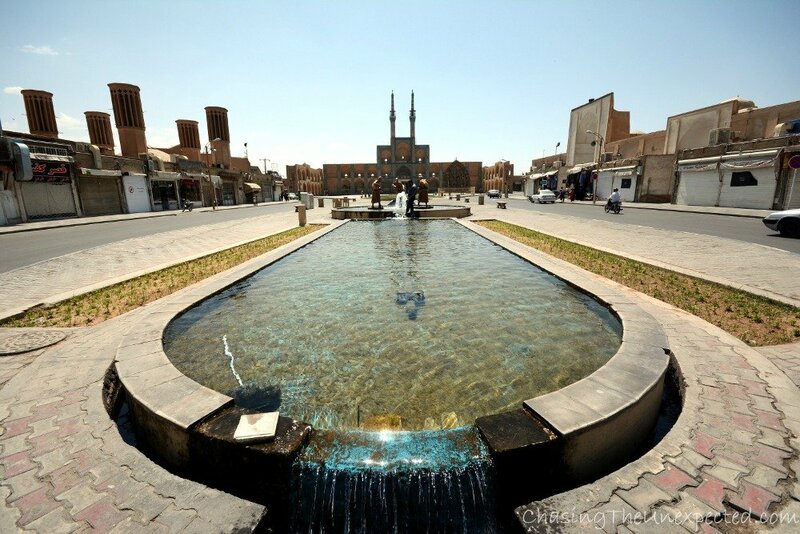 Sure there are many attractions and important monuments to see in the city, such as the Grand Mosque and its sophisticated decorations, the gorgeous Dolat Abad garden and the popular bazaar selling the handicraft Yazd is famous for, but none of them were as bustling. In fact, I was so tempted that I didn’t resist and finally brought home some pieces of the famous Termeh, fine and gorgeous hand-woven fabrics made of silk and wool, almost to re-experience the legendary Silk Road, albeit with much more comfortable means of transportation than my Venetian predecessor. 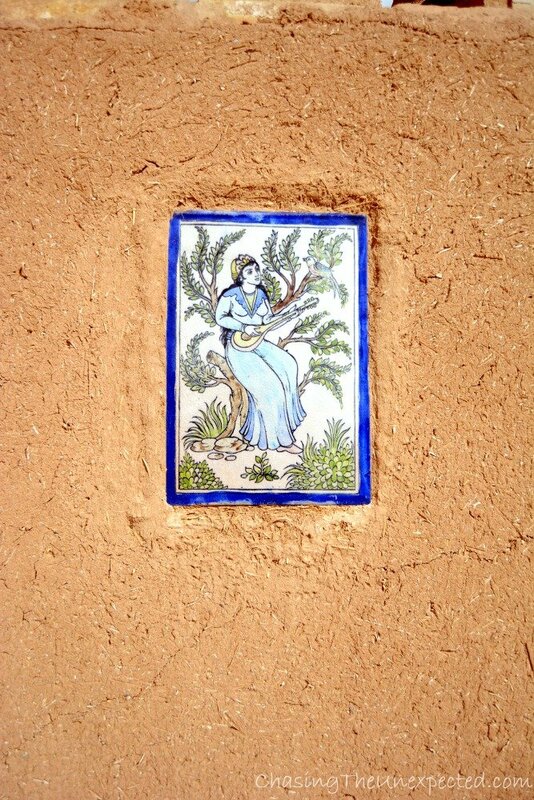 Alongside the Zoroastrian sanctuary, sand and blue shades are easy to spot all over the city center through its buildings, handicraft markets, mosques and houses, creating a delicate contrast. 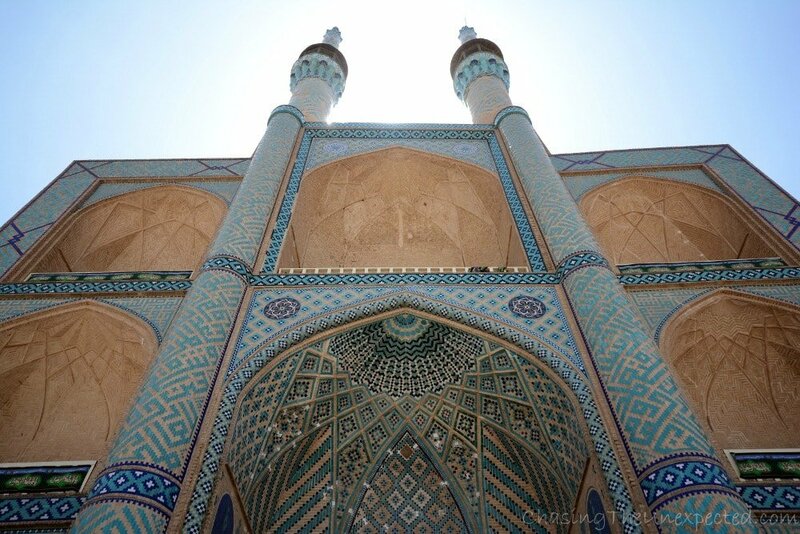 Jameh Mosque is embellished with sophisticated decorations in all shades of blue, from a gentle turquoise to a saturated sapphire in an overall azur tone. A mesmerizing ensemble of symbols and geometric shapes adorns the walls of Yazd’s Grand Mosque, evoking the patterns also used on carpets. 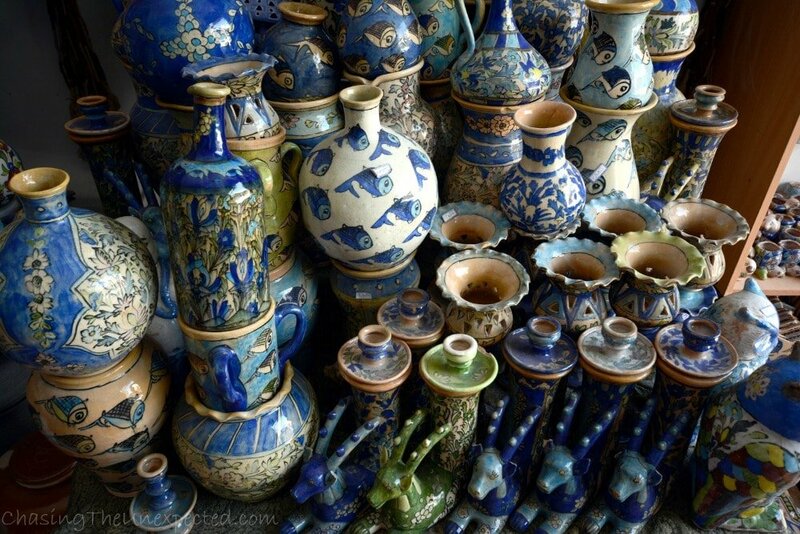 The local handicraft is displayed everywhere, from the local markets to private courtyards turned into shops, most of them offering the perk of a terrace from where to admire the unusual and suggestive skyline of this one-of-a-kind desert city. 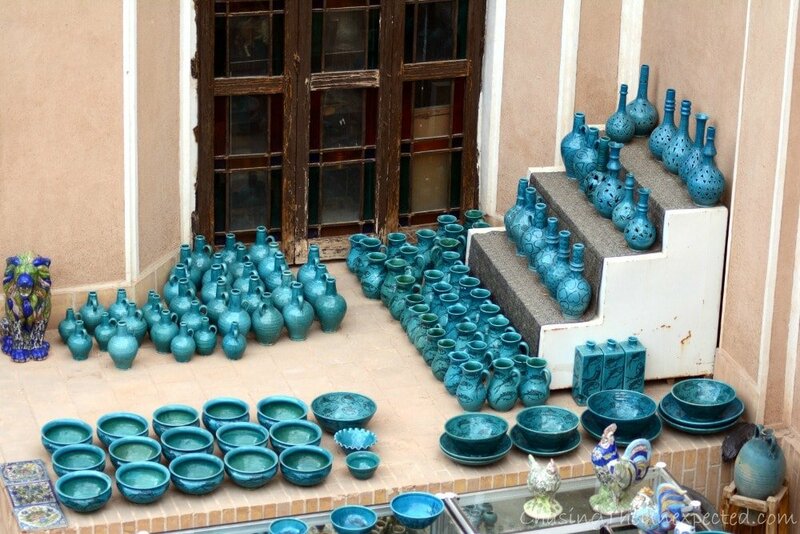 Yazd blue handicraft displayed in a private courtyard alongside its overburdened owner. 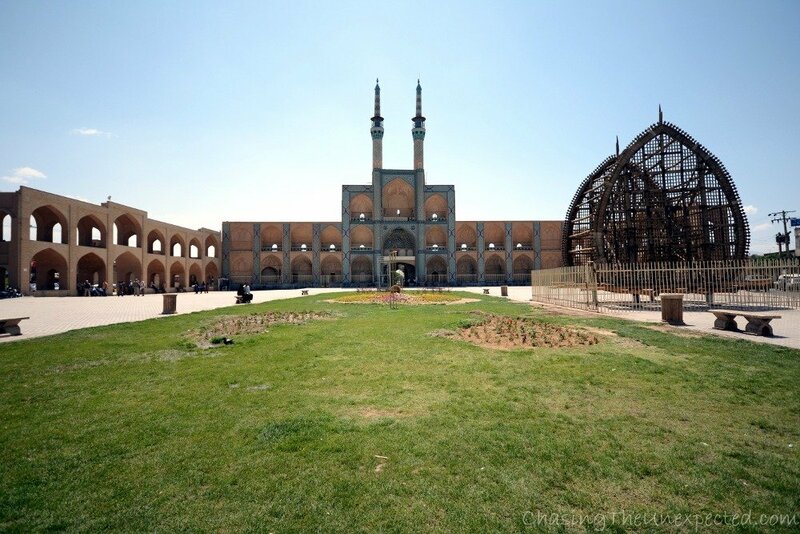 Among the monuments and historical buildings worth a visit are also its Jame Mosque and the beautiful Dolat Abad garden, for each of which I’ve linked to the related post. Below some more shots I took in lovely Yazd, as usual in the hope to inspire you to get there yourselves. 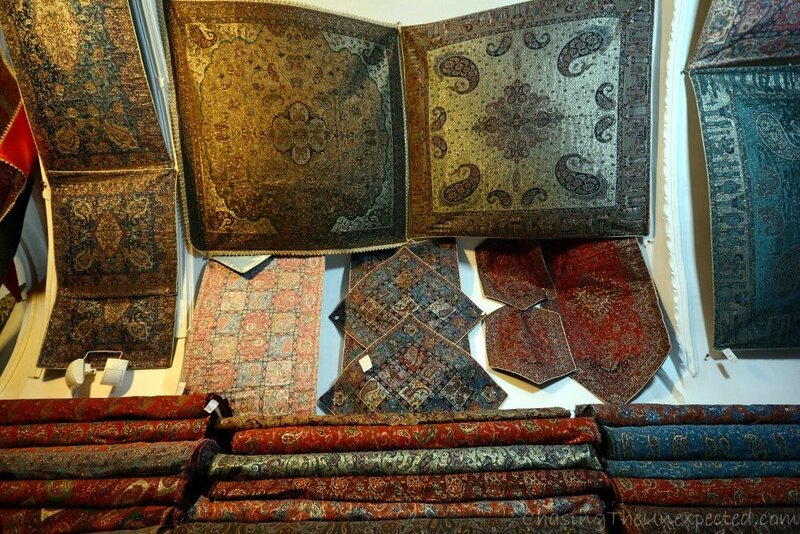 Beautiful Termeh fabrics typical from Yazd, a fine hand-woven textile made of a mix of silk and wool. 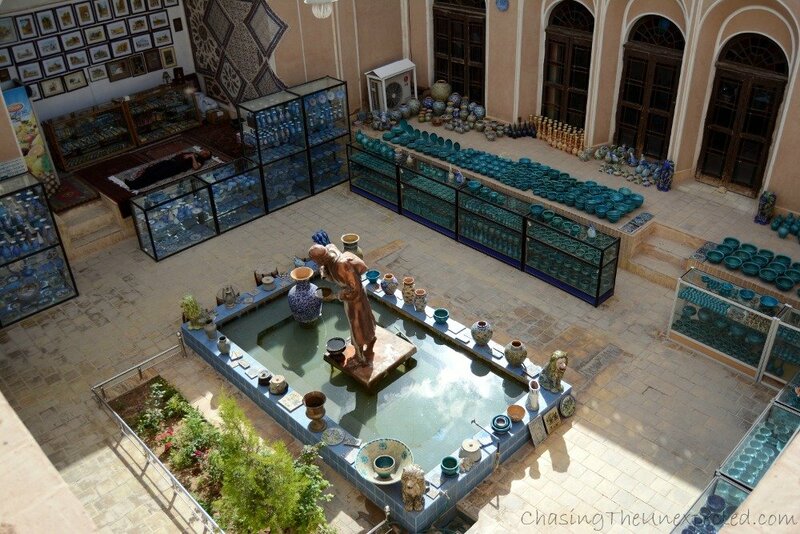 In Yazd you can find tablecloths, runners and all sorts of decoration.